Kangaroo Trading Classic Grab-N-Go Rocker Montana Perfectly Plum with White Childrens Rocking Chairs by Kangaroo Trading at Indsight. MPN: 4075PLW. Hurry! Limited time offer. Offer valid only while supplies last. Introducing the new classic Grab-n-Go rocker kid's foam chair with handle that is an actual rocker constructed with a 100% polyurethane foam core! Introducing the new classic Grab-n-Go rocker kid's foam chair with handle that is an actual rocker constructed with a 100% polyurethane foam core! 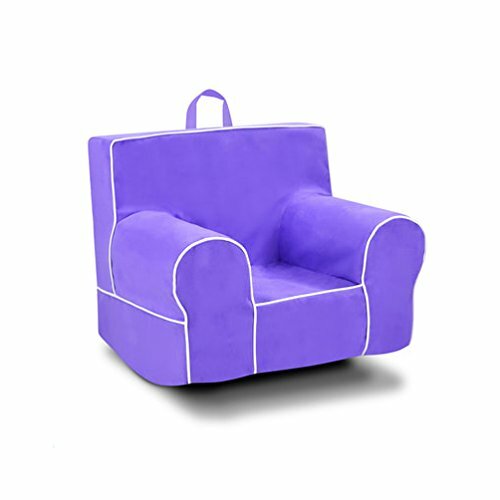 this great, new foam rocker is then covered with 100% polyester microfiber in perfectly plum with its bright purple color. There is a matching handle sewn into the top center of the backrest for ease in moving from room to room. It features a white Welt cord trim surrounding the armrests, seat front and outer backrest edges, and along the outer sides of the armrests for added appeal. The backrest has a horizontal top. The armrests are rounded on top both for style as well as comfort. The seat height is 9" from the floor; 13" wide between armrests and 15.5"D from the front. The bottom is covered with black poly/cotton upholstery fabric, and there is a zipper closure.